Through many decades of involvement with strength training and plain “just lifting weights” I have maintained an outlook that can be described as basic, uncluttered, and direct. In part, this reflects my personality, both positive and negative. I am very much the same fourteen year old that my football and track coach described as “a Polish meatball” and a “rock head immigrant” as my father stated as a summary of both himself and me. I have always been proud to be seen as a street guy with a very good education because it is a truthful and accurate description of what and who I am. My philosophy of training has reflected all of the above. With close to sixty years of weight training behind me and the expectation that there is a lot more in the future, I have always returned to the understanding that results come from hard work. The reps and sets, volume and recovery ratios, actual exercises utilized, and the grams of macro nutrients remain secondary to working hard and doing so on a consistent basis. If one wishes to discuss strength improvement, the conversation comes with the incorporation of basic multi-joint movements, some single joint or “isolation” exercises necessary for specific muscular development and/or injury prevention or recovery purposes, form appropriate enough to avoid injury in the facility, and the acceptance of hard work on every set. If one wishes to discuss “speed” in the athletic arena, the conversation has the potential to become a minefield: running speed; limb speed; speed of body movement; vertical jump ability; force, power, and velocity differences and ratios; change of direction; body weight to strength output; and no doubt fifty other factors or “things” that can be counted by some scientists and fake researchers as important. Having remained a “meatball” I am much more comfortable relating one or two personal anecdotes that proved to be instructive and truthful more than half a century ago and remain applicable to athletic improvement today. I was not a “good athlete,” I was not blessed with either hand-eye or overall coordination that would have impressed any coach. As a twelve year old who began to lift weights with a truck axle, fly wheels, gears, and cement-filled pails, I eventually became a very large and strong athlete with acceptable straight-line speed. I boxed in both Police Athletic League and Police Boys Club organizations with moderate success, engaged in numerous gangster funded street fights for money, bounced in local clubs and bars, and served as Director of Backstage Security for a major recording company, at both east and west coast venues of the most famous rock impresario in the industry, and on a number of rock and roll tours. Not once was I cited for hand speed or the coordination to “stick and move” or slip punches. I played Judo and was a training partner to two members of the United States Olympic Team and two others who represented our nation in the Pan American Games. I was a slug who could take a beating, provide a decent workout to the better practitioners, and was never lauded for my own skill or abilities. I ran track in order to be better conditioned for football and did so with minimal grace or elan but it was evident that as I became stronger, I could run a heck of a lot faster. Over the course of approximately fifteen months my body weight increased from 150 pounds to 232 pounds and it was done “the old fashioned way” with a lot of what we used to describe as barbell deep knee bends, deadlifts, press, bench press, and rows as the centrum of almost all of my programs. I ate a lot and ate frequently while supplementing with two or three high calorie, high protein drinks per day that were mixed in a large bowl with an egg beater. Heavy cream, ice cream, non-fat milk powder, and eggs were always the “base layer” with the inclusion of almost anything edible that was at hand, left over from a previous meal, and could be beaten to a drinkable consistency. Do our readers truly want the recipe for a Tuna Hot Fudge Sundae that would provide “protein and dessert” in one sitting? I became significantly, muscularly larger and stronger and in turn, I became significantly faster, reducing my time in the 100 yard sprint from 10.1 at 150 pounds to consistent 9.8’s and occasional 9.7’s at 232. My 40 yard times were always in the 4.6 range, absent the development of electronic timing. I was rather pleased of course to have become significantly larger in muscular size and would often return to my former high school coach for running advice. He was a U.S. Olympian in 1948 and the holder of a number of NCAA records who was an early proponent of weight training which he credited with his own athletic success. He had moved on to become a highly respected and well known collegiate head coach but always made time for our conversations. Most of my high school friends and many at college assumed that as I continued to grow to what they saw as outlandish proportions, I would “get slower.” Even one of our college coaches stated that I would be moved from fullback to offensive guard if I reported at a pound over 205 pounds. Yet, I grew and I became faster. I became stronger in my usual lifts and became faster. My old coach patiently explained that as my squat and deadlift poundage had increased, so had my ability to exert more force with every footfall when sprinting, “thus, you’re faster because you’re stronger.” That was a very simple explanation that was logical and made sense to me and I have stayed with that one to this day. We also discussed weight and strength ratios and body fat percentages. “Visualize fat as a negative factor. It doesn’t contribute to active movement work and if you picture muscle cells inter-laden with fat cells, those fat cells for lack of a better explanation can act like a friction brake.” He noted the larger engine in the smaller car, using the example of me having the same strength but at fifty pounds less body weight. I would not have had that same strength of course but he made the point that at whatever body weight an athlete was at, it was imperative to be as strong as possible, to be as muscular and fat free as possible, to be able to exert as much of that strength as possible, and to thus utilize as much power as possible. Running skill, like any athletic skill, is important. Running speed is also a matter of efficiency. Football players are not track athletes and we can certainly have a conversation that mimics that from the weight room when coaches utilize highly skilled lifting movements. 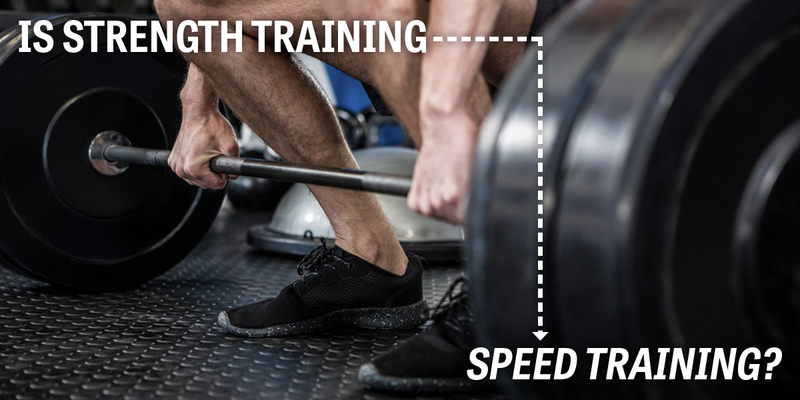 There is little justification to utilize the exercises that require so much skill knowledge, learning, coaching, application, and supervision that at some point, a point in time that often arrives quite quickly, it makes little sense to utilize the movement because too much time and effort is detracted from actually training to become strong. A football player in this case, should understand and practice the basics of coming out of their stance and have an understanding of efficient sprinting mechanics but must practice the skills of the sport of football in order to best apply their abilities and any enhanced strength. Efficiency in doing the “tasks” of the specific sport correctly also translates to “improved speed.” Thus like weight training and strength enhancement, one can get as complicated as they wish regarding “speed training” but there is in my opinion, little need to do more than train hard, do so consistently, become stronger, apply that strength to the field, be as lean as possible, and have an awareness of practiced and proper running mechanics. For more information about Dr. Ken, go here.